With five bedrooms, well-appointed living spaces and landscaped grounds, Villa Yee Sip Hok is ideally kitted for groups of 10 and lends itself to events and weddings. Villa travellers will appreciate the property’s scenic surroundings, stunning sunrise views, serene environment and easy access to restaurants and attractions. Five bedrooms, each decorated with soft, muted colours and artworks accommodate 10 adults in the villa. There’s ample storage space for your belongings, plus quality bedding sets and blockout curtains to facilitate uninterrupted sleep. Each room features a spacious en suite bathroom equipped with rain showers and oversized bathtubs. The grounds are beautifully landscaped all around the property, with manicured lawns and walkways connecting the living spaces. A garden is built into the heart of the villa, so you’ll enjoy being surrounded by lush greenery whether you’re lounging outside or indoors. 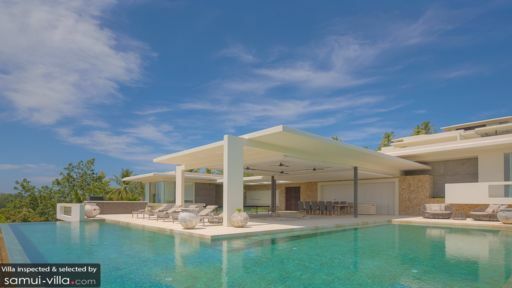 Guests have plenty of options for basking outdoors - take a dip in the infinity pool, recline against the loungers by the poolside or curl up on the daybed. There’s a patio equipped with BBQ too, so your personal chef can whip up a feast for dinner parties. The decor at Villa Yee Sip Hok is minimalist and modern. Neutral hues of cream, white and grey dominate the colour scheme, and the interiors are open, airy and clean-lined. 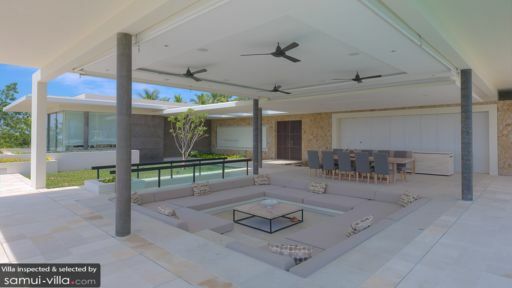 The main living area boasts an indoor-outdoor design, and leads seamlessly towards the pool deck. It features a sunken lounge, as well as a dining set for 10. The property also contains an air-conditioned living room for lounging, two fully equipped kitchens, a bar, a beautifully appointed cinema room (complete with Nuovo surround sound system) and a fitness room. 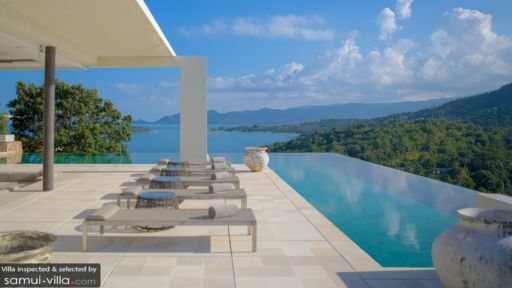 Villa Yee Sip Hok is located in Choeng Mon, a coastal village in the northeastern region of Samui. The vibes here are family-friendly, and lively without being overly crowded. From your villa, you’re an easy drive to the beach, night markets, restaurants, yoga studios and more. Choeng Mon Beach is about four minutes’ drive from your villa. It’s popular with families and couples, and offers a good selection of restaurants and activities; here you can sunbathe, swim, snorkel, kayak or go scuba diving. Just 15 minutes’ drive away Fisherman’s Village, a hub with boutiques, cafes, pubs and restaurants. Every Friday evening, the area is abuzz with activity when vendors set up shop for the weekly Fisherman’s Village walking street. Visitors can look forward to plenty of street food, shopping, live music and performances. Guests at Samujana enjoy exploring the town’s many lifestyle attractions. There’s Yogarden Samui, a yoga studio offering yoga, meditation and fitness classes, along with alternative healing therapies and an on-site healthy cafe. Enjoying a spa session at Six Senses Spa is an unparalleled experience; here, treatments take place in salas or spa villas with views out to the bay. At Yodyut Muaythai Gym, you’ll easily work up a sweat by training with one of the facility’s instructors. If you’re into organic food and cooking, you’ll enjoy cooking lessons at Island Organics (you’ll get to tour the facility’s eco-friendly garden too). While Samui is home to numerous temple complexes, the landmark attraction is undoubtedly Wat Phra Yai. Otherwise known as the Big Buddha, the temple complex is known for its golden 12-metre Buddha statue. It’s particularly beautiful at sunset, and you’ll enjoy sweeping views from the viewing platform at the summit. We’d suggest combining your visit a trip to Wat Plai Laem, as the two attractions are within a five-minute drive of each other. Some of the island’s best dining venues are located just five to 15 minutes’ drive from your villa. We’d recommend The Larder for European gourmet fare, Salefino for enjoying Italian food in a relaxed waterfront setting, Dining on the Rocks for a fine dining experience, Clyde Cafe and Bakery for cafe fare and Supattra Thai Dining for its personable service and scrumptious Thai dishes.